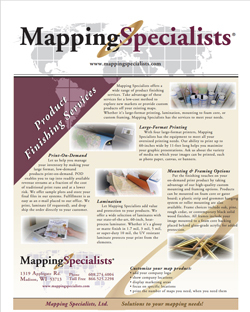 Mapping Specialists offers a wide range of product finishing services. Take advantage of these services for a low cost method to explore new markets or provide custom products off of your existing maps. Whether it’s large format printing, lamination, mounting to foam core or custom framing, Mapping Specialists has the services to meet your needs.